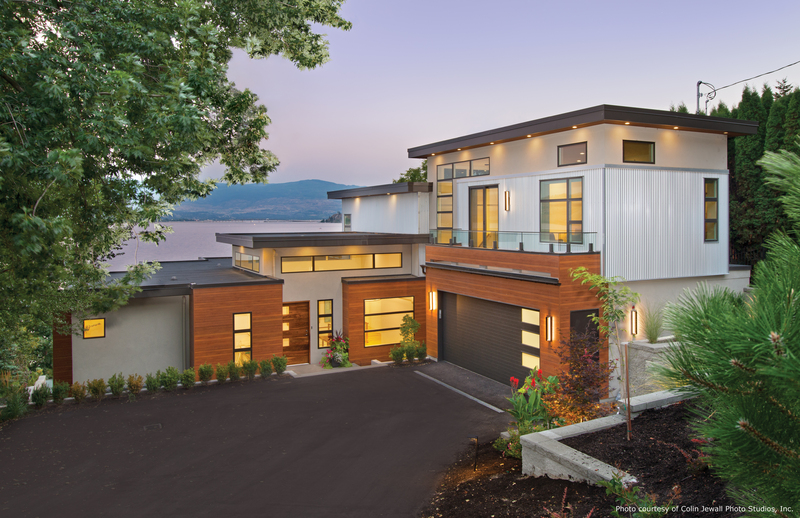 A former professional hockey player, Cory Cross, and his wife Shannon, a former police officer, purchased a home in Kelowna, British Columbia, overlooking Lake Okanagan. After years of moving from place to place, it was here that they decided to take up permanent residence. "I had always talked about wanting to move to Kelowna just for the quality of life and it's a nice place to raise our family," said Shannon. The Crosses wanted to raise their two children in the comfort and stability of a place they could call home. With Cory's career, they were always moving from city to city and traveling, living in various U.S. cities, as well as Germany. It was during this time the Crosses started to formulate their dream of the perfect home. They targeted the Okanagan Valley, drawn to Kelowna by the vibrant community, recreational activities, wineries and social opportunities. The original house was built on a hillside, nestled into the landscape, with a view of the city across the lake. The Crosses loved the property and the view, but the house was not quite what they wanted. Their plans were to rebuild a home designed for entertaining family and friends. The house was cold and drafty; the single pane windows were inefficient and heating bills were high. The windows also were very small, barely revealing the mountaintops, so the outside views could not be fully enjoyed. The lake only could be accessed through the basement, and the floor plan did not have the desired flow. Realizing the house could not be renovated to their liking, they decided to tear it down and build their dream home. The Crosses spent the next 10 years planning the design of their home, gathering inspiration and ideas, while continuing to move around between the U.S. and Europe. Inspired by the beauty and colors of the landscapes seen on their travels, Shannon took an interest in art and painting, and carried that influence into the design of the home. "Having tons of natural light in my studio was so important to me," she commented. The challenge was to create a modern home that was still casual, soft and comfortable. Initially thinking that modern homes were not warm and friendly, Cory soon was convinced he could have the best of both worlds. The Crosses initially worked with a draftsman who drew plans for a home. Through a friend, they met James Wilson of Wilson Custom Builders in Kelowna, who tweaked the design and introduced them to Kolbe's VistaLuxe® Collection. "The windows connect you to the natural environment and bring natural light to the home," said Wilson. "You don't want to pay attention to the window itself; you want them to frame the view and disappear. That's exactly what VistaLuxe does." The Crosses worked very closely with Wilson, and the design evolved throughout the construction process. VistaLuxe had the contemporary look that brought the plan to a new level. The windows were integral to the design, drawing in light and connecting the interior with nature. "Light is critical to a home. Especially natural light," emphasized Wilson. The design required clean lines, and that's just what VistaLuxe provided – narrow-framed, Flush style direct set windows. Shannon elaborated, "James knew we needed a higher end, very efficient window, but we also wanted a certain look as well. Kolbe had that look that we wanted, from the inside, but mostly from the outside... clean lines... and very flush with the home." A Truffle color, exterior cladding adds to the modern aesthetic, while a natural wood interior adds a warm, organic feel. The Crosses wanted a home where they could socialize and entertain with common areas of the main floor being accessible to the outdoors. The plan was to build as close as possible to the water and on the same level, so there was a free flow of movement between the kitchen and the outdoors without going up or down stairs, with the ability to see the pool from just about any room. "We based the entire build on the summer months, wanting to take the outside in," Shannon explained. "The open floor plan utilized a natural material palette, for a slight West Coast feel: stone, brick, wood and steel beams, concrete and glass. The glass offered a fresh, organic feel. Being able to see the water from every room in the house was really important to us," Shannon added. The Crosses and Wilson saw Kolbe's VistaLuxe Collection windows and doors as a natural fit. Unique configurations of direct set windows created large expanses of energy-efficient LoE³-366 glass on all sides of the home. 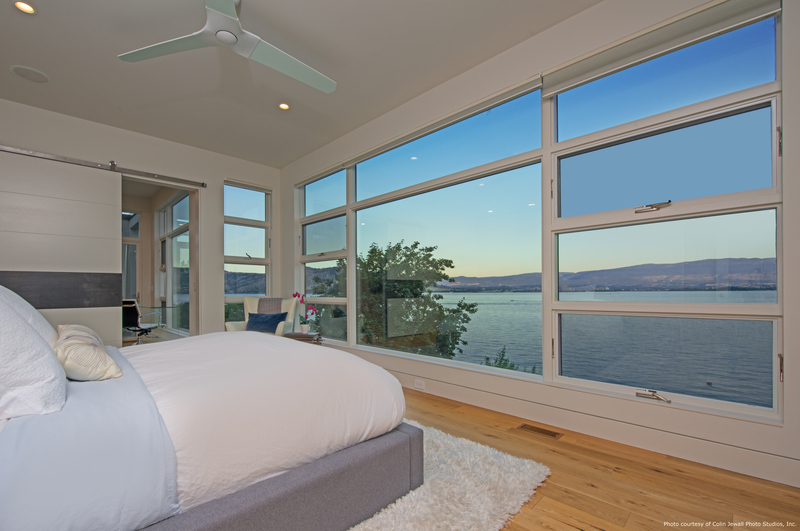 Picture casements and awnings also provide thermal performance, while welcoming panoramic views of the lake. 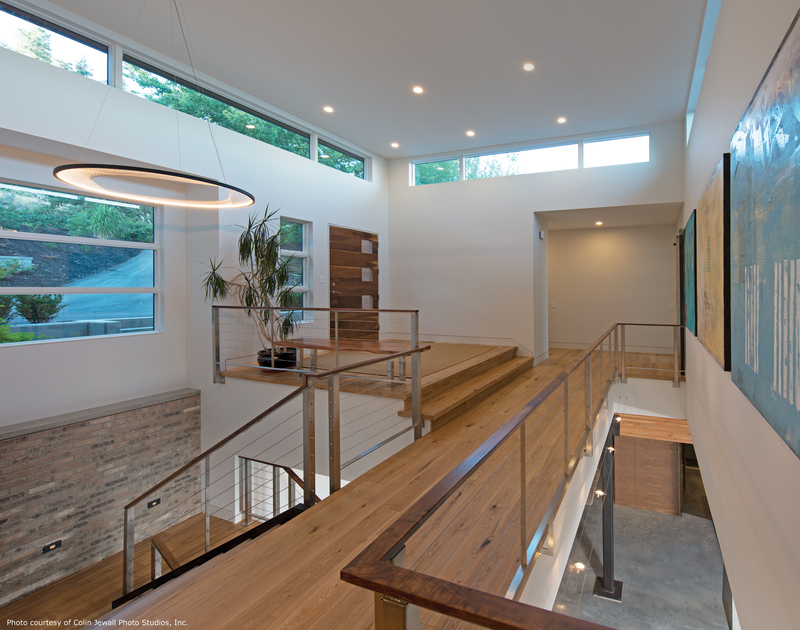 Transoms and clerestory windows span the entry to provide passive daylight. Outswing patio doors, French patio doors and sliding patio doors allow passage to the pool and make foot traffic convenient. "Having large glass doors that slide open . . . to the outside pool deck makes it easy for everyone to enjoy the outside from most parts of the home," stated Shannon. Wilson concluded, "The views were number one. I think even more important ... was... making sure we were connected to the lake from every room." 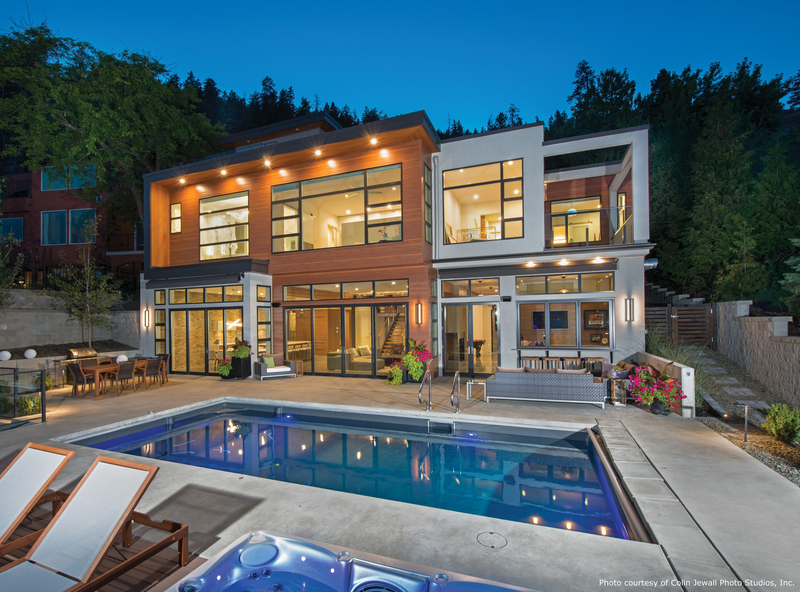 Along with the homeowners' praise, Wilson & Company received a 2017 Tommie Gold Award for "excellence in a single-family detached home $1.5-2 million" from the Canadian Homebuilders Association's Central Okanagan chapter.